Several years ago we began to be aware of our environmental footprint and took several steps to reduce that footprint. (aaahhh – I said STEPS & footprint – see what I did there?) First we took a good hard look at the overabundance we already had and stopped ‘boredom shopping’ for yet more stuff to overfill our home. That was a pretty big step. We also took a look at the stuff we typically purchased in the store and I learned how to make some of those items for myself. I learned to make spice mixes and amazing homemade brownies. And I learned to make my own low-fat yogurt and pasta. I even learned how to make cold-process soap. Learning those things has been a fun hobby for me. But today I want to talk about something that can make a larger impact: Buying used instead of new. It’s good for your finances and good for the environment. Yet it’s oftentimes very misunderstood. Buying used items from thrift stores instead of buying new has several advantages. First, a new whatsit doesn’t have to be manufactured, packaged and shipped for your purchase. Plus the cost is usually less for the item you’ve just purchased at a thrift store. And oftentimes you can buy higher quality for the same or less money than the new & oftentimes flimsier versions. Add to that the benefit of helping a good cause by the thrift store and you’ve really got a winner! We donate to charitable thrift stores every chance we get. It removes extra “Stuff” from our home and allows someone else to enjoy those things that we no longer use. The best part of this of course is that the money made from the thrift shop’s sale of our goods furthers a good cause we believe in. But there’s a stigma here that I feel I must address. Many well-meaning people think that since thrift store goods are “donated to charity” that those goods are earmarked to go to the underprivileged. And I think in some cases that may be true. But for most charities that have a thrift store, your household donations don’t do the organization you’re trying to support any good. It’s the SALE of those items and the money made from that donation that funds the organization. Shopping at those thrift stores closes the loop of charitable-giving. I feel good about buying clothes and household goods at charitable thrift stores so I close the loop by buying there whenever possible. Of course there are certain things that for me are only purchased new but that list is actually pretty small. 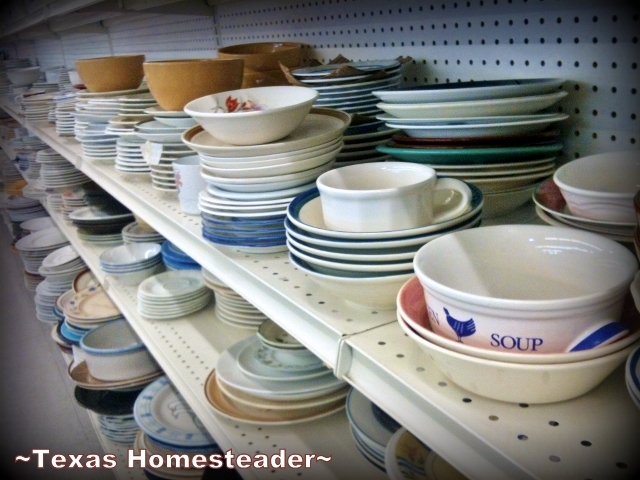 I’ve purchased clothes and bake ware, electronics and garden supplies at thrift stores. And when I asked my Honey to build me a large mirror framed with wood from our 1880’s barn, I knew I would not be purchasing the actual mirror part new. We bought an old beat-up dresser mirror from a charitable thrift store at a very reasonable price. 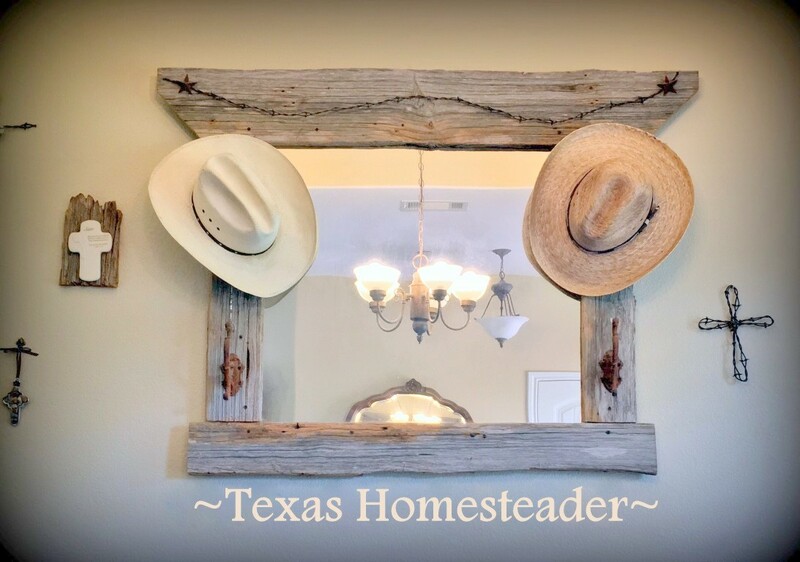 RancherMan then remade the frame to include my 1880’s barn wood, some of the old square nails from the barn and even embellished it with some of our 1882 Elwood barbed wire found on our property. But the purchase of that old beat-up mirror means our money went to help an organization that I believe in. And my mirror turned out to be a beautiful and meaningful addition to our home. What about you? Have you noticed a lack of understanding from friends and family about shopping at thrift stores? Let’s get the word out and help some great causes! Food Waste in America: What Do Those Dates Mean? C’mon by & sit a spell! Come hang out at our Facebook Page. It’s like sitting in a front porch rocker with a glass of cold iced tea – lots of good folks sharing! You can also follow along on Pinterest, Twitter or Instagram. If you’d like to receive an email each time a new blog post goes live it’s EASY to Subscribe to our blog! This entry was posted in Blog Posts and tagged Environment, Frugality, Make-It-Yourself on May 5, 2013 by Texas Homesteader. Good article ~TMH~, Being in the building industry now for over 35 year and still doing it. My wife has saved us Thousands of dollars, just on my clothes alone. I literally destroy clothes especially when it comes to painting. Every Friday including today we will hit the second hand shops. There are only 3 of them in town .Summer being here finally we will do the garage sale too if we are looking for something specific. Need to be careful about buying things you like but really don’t need in our case. We support and donate to the Kiwanis second hand, the church mouse house second hand and one other I can’t spell but know they support women who are in need and scholarships for girls who want to go to collage. Second hand is smart hand…. I am a HUGE thrift store fan! It’s so fun to check them out and see what you can find….every trip is like Christmas because you never know what you’ll come across. We’re also big proponents of donating anything we can instead of throwing it away. One man’s treasure and all that….. 🙂 Thank you so much for sharing this with us at Merry Monday! We hope you’ll join us again this week! Great Post! Thanks for sharing on My 2 Favorite Things on Thursday!! Hope to see you tomorrow!! Pinned! Thrift stores and resale/ consignment stores are a great places to shop! Too often emphasis is placed on getting the newest and best of something. And while, I do enjoy shopping and getting new items, at the end of the day, jeans are jeans. 😉 Thanks for sharing at Idea Box. Great post! I am an avid Thrift Store shopper! And I know many of my well-to-do family members look down on it, even though they regularly donate themselves! I may just have to share this with them! Found you at A Little R & R Link Up! I have always shopped second hand. I find the best things! We buy almost everything used, (except food! ), be it from charity shops, ebay or other secondhand sources. I think there definitely is a stigma about it for some people, but now that we are used to it, it seems a huge extravagance to buy most things brand new! Thrift stores are a way of life for us. It is a blessing to reuse and find treasures. The thing I find amazing, is that most of the people who wouldn’t shop at thrift stores, don’t think twice about shopping at antique stores. To me, that’s just high priced second hands stuff. I prefer finding a thrift store or the old junk store. I’ve found some really neat stuff at “junk stores”. We moved to England 5 months ago from Washington state. They call them “Charity Shops” here in the U.K. and the stigma is very different. People view shopping at charity shops a very good thing because you are supporting a cause. Many of the shops are named for the cause they support “cancer research association” “Heart Association” “Hospice care”, etc. Great article. My husband and I have a favorite, church-run thrift shop where can pass on things that are still in excellent shape but are looking for something different . We’ve found some great things there and are always happy to trade them our money before paying a chain store for something less interesting and more expensive. I’ve never thought of it as closing the loop, but that’s exactly how to describe it. And that makes me even happier! I wish we had true thrift stores near us here. Mostly they are the “chain” (GW, SA) stores where the prices of used clothing matches what i can buy for new at Wal-Mart or on sale at Target. I never feel like I am getting a good deal or really helping anyone out when I shop there. I miss the shops run by the churches where we lived in OK City that really gave back to the community, used mostly volunteers to run them for lower overhead, and had buck-a-bag day sales. LOVE this post!!! Thanks for sharing at Tuesdays with a Twist. YOU have been featured this morning. Come on over and share what you’ve been working on. I love thrift stores! I don’t like to pay retail for anything! I have found some really nice things at thrift stores, including clothes with tags still on them!! I think the shopping at Thrift Stores is becoming more acceptable for sure. I’ve done it for years and will buy most anything there (except underclothes LOL). I have gifted friends with items they LOVE and let them know it came from a thrift store and they got a gift they love, I got a great gift at a price I could afford and the money went to help others (I’m picky about my thrift stores also). Great post! Thanks for sharing with us at TTF who are the believers! When I need ‘new’ clothes, that’s where I head…Usually the Salvation Army. I like supporting them and saving money at the same time! 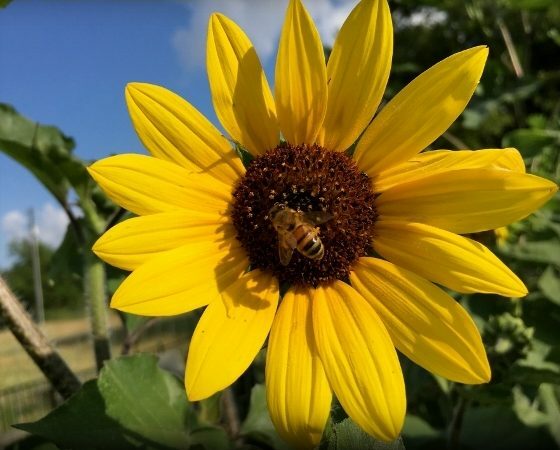 Thanks for sharing on The Creative HomeAcre Hop! So glad you posted this! The SALE is what completes the giving! Thanks for sharing with us last week at at Eco-Kids Tuesday!!! Hope you stop by again today! I love thrift store finds! I have found some of the best stuff there! We can’t wait to see what you share at tomorrow’sAll My Bloggy Friends! We pretty much do all our clothes shopping at thrift stores. The only things I absolutely refuse to by used are socks and underwear! (especially underwear) My kids love going (of course they run straight to the toy section) and get excited when I pick out new (used) clothes for them. I think it helps also that we homeschool and I know it will be less of a temptation to get caught up in the need to look and dress like everyone else. My mom and sisters love thrift store shopping and it seems everyone I know loves going too. As a result of my passion for buying from thrift stores, I have “converted” non-believer friends into thrift store shoppers. Sometimes people can’t get past the “vintage” associated with thrift stores and they miss out on great, “modern” items that would easily fit their current lifestyle. All we can do is keep spreading the word about The Magic That Is Thrift. Great post! I’m an avid thrifter, but this article makes an excellent point! Thank you for sharing at the Give Me the Goods Link Party! I love both donating to AND shopping at all eight of our local thrift stores. I love it so much I started volunteering in the book section at one. Thanks for sharing the joys of thrift store shopping! I ‘d like to add one suggestion. When you gather your own items to donate, if you can’t close your eyes and imagine it for sale in the store, then perhaps the item has lived a full life and should be discarded. As a volunteer I’m amazed at the amount of trash, really trash, that gets dropped off for donation. A chipped drinking glass should be thrown away. A shirt with a huge stain should be thrown away. A twenty year old college textbook should be thrown away. Or if you have a facility capable of recycling these in your community, take those items there. I love going to the thrift stores! It has become a Saturday routine for my husband & I. In the summer we search for yard sales, then hit the thrift stores and in the winter we just go to the thrift stores. I have found numerous items that I would not have purchased new. I also donate items to them.